This October, we're returning to the Lighthouse Inn in West Dennis, Cape Cod, for our fall retreat! This inn is ocean front, and our sewing room looks out over the water! Check it out! This retreat will take place October 5-8, 2017, and you can stay for two or three nights. Costs include hot breakfast and use of all the facilities. The sewing room will have ironing boards and irons, and each sewist will have her own table. 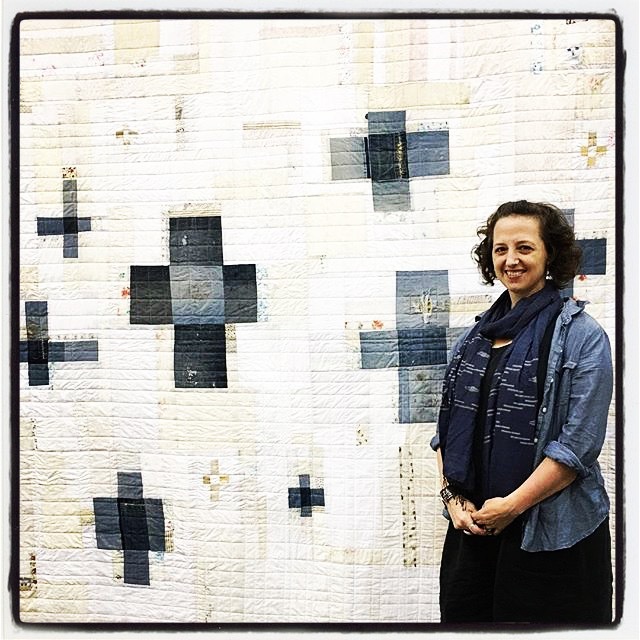 On Saturday, October 7, we will be welcoming award-winning quilter, fabric designer, and author Melissa Averinos for a trunk show at the Lighthouse Inn. Melissa is well known for her improvisational faces, and her quilt My Brother's Jeans (pictured below) won Best in Show at QuiltCon 2016. You can learn more about Melissa on her website and see more of her work on Instagram. The fall retreat is a members-only event. Payment is due in full. Please note: If you sign up and later learn you cannot attend the event, you are required to find your own replacement. If you want to register for the retreat or have any questions about the weekend, contact Patty at pamagaw (at) comcast (dot) net. If you have questions about membership, contact Michelle at michelle.l.cain (at) gmail (dot) com. Our June meeting will take place on Tuesday the 20th! June is going to be a busy month! Pixie Baskets: It's time to swap our Pixie Baskets!! If you haven't started yet you can find the directions here. If you won't have a chance to finish just let your partner know and decide on an alternative time to swap. WIPs: You can still signup for our WIP contest at the June meeting. Please see Nancy Tatro. QuiltCon 2018 Challenge: Carolanne will be sharing the parameters for the 2018 QuiltCon challenge quilt and we'll be discussing how to best work as a group to design this project. Crazy For Hexagons! Programming this month will be all about Hexagons. 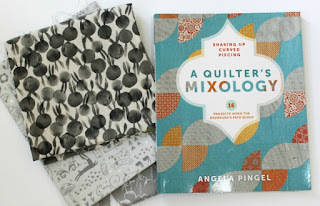 We'll have three different stations setup to show different ways to create these 6 sided quilting staples. Fall 2017 Retreat: Registration for the fall retreat on Cape Cod will open online at 8 p.m. on Sunday, June 25th. More details will be shared at the meeting on Tuesday and posted online next week. Giveaways & Raffles: Our giveaway item will be Dritz Needle Tip Tweezers.We will also have two raffles! * Raffle #1: Three half-yards of Sleep Tight by Sarah Watts for Cotton and Steel. * Raffle #2: A Quilter's Mixology: 16 Projects Using the Drunkard's Path Block by Angela Pingel.